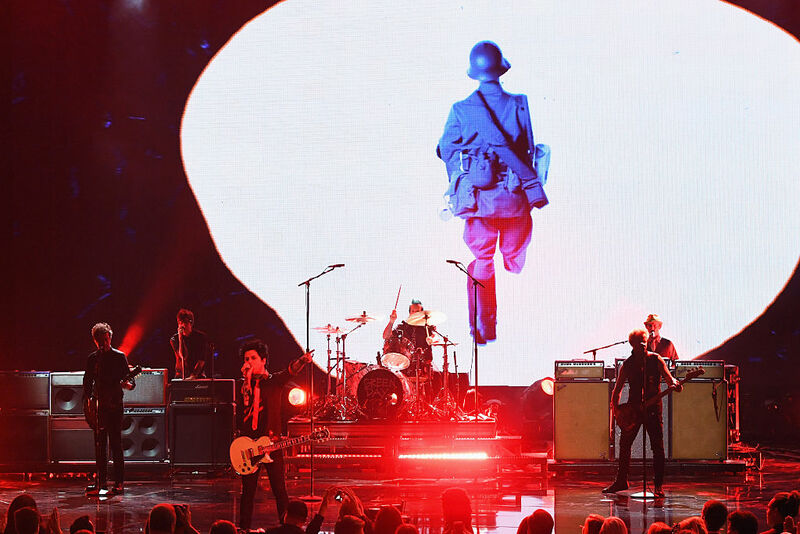 "No Trump, no KKK, no fascist USA"
Veteran punk rockers, Green Day, caused quite the stir at the American Music Awards this weekend when, during a performance of "Bang Bang", lead vocalist, Billie Joe Armstrong broke into an anti-Trump rallying cry before a packed Microsoft theater. "No Trump, no KKK, no fascist USA!" growls Armstrong, somehow managing to sum up the frustration of music fans aggrieved at Trump's ascension. As Rolling Stone point out, the chant is a take on an old protest cry: "No War, no KKK, no fascist USA!" which can still be heard at protests today. With arms raised high, and the bravado that only good rock dad BJA could pull off, Armstrong brought forth a 2016 re-imagining of their (semi) political roots. green day: no trump! no kkk! no fascist USA! 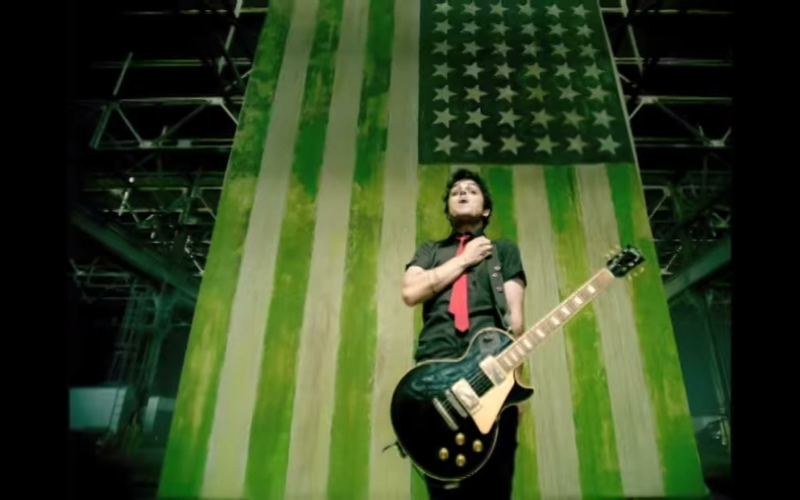 Despite taking care to toe the line of controversy and record sales, 2004's American Idiot had deeply political undertones. Their second album of the new millennia tackled topics from fascism, war, and open rebellion; their careers seemingly emboldened by Bush-era politics. Now, as the specter of a Trump presidency looms darkly in the foreground of global politics, a resounding silence from the genre has forced Green Day to, once again, shrug on their shawls of (semi) political resistance. Without making too sweeping a generalization, it's clear that Green Day effectively inspired an entire generation of rock fans, from Dookie all the way to Revolution Radio. Pop punk bands making waves today can (and do), rightly cite Green Day as an influence (much to Armstrong's chagrin). So, with all we know about modern pop punk's fore-bearers, why is the genre so profoundly apolitical? Despite being born from a movement that was pointedly anti-war, anti-government, and anti-establishment, pop punk has managed, quite impressively, to divorce itself from anything vaguely resembling political (or meaningful) discourse. Let me put it this way. Post-fact propeganda threatens the integrity of democracies around the world and your faves are still writing songs about "getting out of this town". I get it, though. In the mid-2000s, the frontmen and women of all your favourite acts were barely adults, themselves. Who cared about politics? We were knee deep in the hellscape of a George Bush/Tony Blair love affair that seemed, at the very least...manageable. It was bad but it wasn't, you know, the living breathing KKK. Pop punk fandoms are strong. They're powerful, articulate, and have demonstrated a voracity for organizing around common themes. So, in the interest of a more perfect genre (see what I did there? ), I am of the belief that pop punk, as a whole, should chime in. Bands and their individual members should tweet about ways to fight against closures of Planned Parenthoods across America (many pop punk fans are women, ya know? ); Donate to LGBTQ crisis help lines or the anti-defamation league. Write a freaking fight song. Do something. 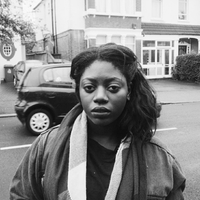 I'm bored of empty lyrics that swerve the very real implications of government sanctioned racism, sexism, and homophobia. When you wield the power to influence swathes of young people, activism (or at least some show of it) becomes a moral imperative.